See the stories of the Scriptures come to life as you walk in the footsteps of Jesus on this faith-based journey which includes some of Christianity’s most important sites. In Israel, visit sites of biblical importance such as Megiddo, Cana and the Mount of Beatitudes and hear the stories of the Bible told over time. The Old City of Jerusalem will leave you amazed as you see and learn more about Jesus’ life. And with an opportunity to float in the Dead Sea, it’s the perfect way to wind down and prepare for the next highlight Jordan, which combines history, art and fun but also gives several opportunities for meditation. Enjoy four-wheeling through sand dunes of the desert; discover Petra, one of the New 7 Wonders of the World®; and enjoy a relaxing two-night stay at a Dead Sea resort. Visit Mount Nebo where Moses saw the Promised Land and Bethany Beyond the Jordan where Jesus was baptized by John the Baptist. These are opportunities for prayer and reflection, bringing you closer to your faith and at the same time appreciating a truly inspirational destination. Headsets throughout the tour (except in Jordan). 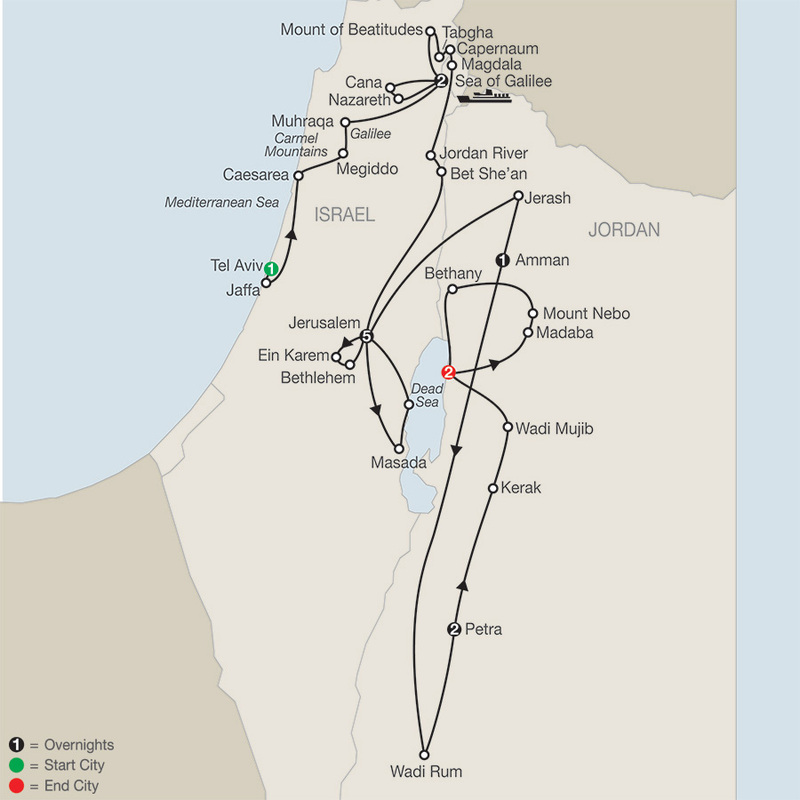 "Baptism Site ""Bethany Beyond the Jordan""
Motorcoach (or minibus); boat cruise; cable car. Free Wi-Fi available on your motorcoach and in most hotel lobbies. Welcome to Tel Aviv. 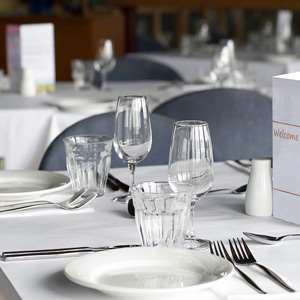 Enjoy this evening’s welcome dinner, hosted by your Tour Director, who will introduce you to your upcoming spiritual journey. Your tour of the Holy Land begins in Jaffa with a walk through the beautifully restored ANCIENT PORT, where medieval pilgrims started their strenuous 2-day trek to Jerusalem. Next is Caesarea, the perfect place to learn about the Roman and Crusader presence in the country. Visit the archaeological site with the ROMAN AMPHITHEATER and the impressive medieval CRUSADER FORTRESS, and admire Herod’s Stadium and harbor. In the afternoon, travel to the ancient fortified city of MEGIDDO—one of the world’s most important biblical sites. According to the New Testament, the Battle of Armageddon (another name for Megiddo) will be the final struggle between good and evil, prompting the return of Jesus to defeat the Antichrist and cast Satan into the abyss. Continue north, to Mount Carmel, considered the most holy of all mountains in ancient times. At Muhraqa, site of Elijah’s contest of faith with the priests of Baal, enjoy a sweeping panoramic view of the fertile Jezreel Valley, where Gideon led the Israelites to victory against the Midianites. Arrive at your hotel in Tiberias on the western shore of the Sea of Galilee. Visit CANA, site of Jesus’ wedding miracle turning water into wine. Even now, many couples renew their wedding vows at this sacred place. On to Nazareth, the Virgin Mary’s home village, and where Jesus spent part of his childhood. Visit the CHURCH OF THE ANNUNCIATION; ST. JOSEPH’S CHURCH, built over Joseph’s carpentry workshop; and pass by Mary’s Well and the Church of the Angel Gabriel, where the Angel Gabriel told Mary she would give birth to Jesus. Later enjoy a CRUISE on the Sea of Galilee and see an ancient fishing boat, said to be from the time of Christ. Much of Jesus’ ministry occurred on the shores surrounding the Sea of Galilee. It is where he recruited four of his apostles, walked on water, calmed the storm, and fed the multitude. Visit the MOUNT OF BEATITUDES, where Jesus delivered his Sermon on the Mount. Next, visit the CHURCH OF THE MULTIPLICATION OF LOAVES AND FISHES at Tabgha, as well as the CHURCH OF ST. PETER’S PRIMACY, where Jesus instructed Peter “to feed my lambs and tend my sheep.” Warm springs once flowed into the sea here, attracting fish, which is why Peter came here to earn a living. On to CAPERNAUM, where Jesus recruited his first followers among the fishermen. Continue to MAGDALA, a city dating back to the first century and where Jesus taught in the synagogue. Via the ruins of Kursi, which memorialize two of Jesus’ miracles, arrive at the Jordan River and visit a BAPTISMAL SITE. Then, pass through the ancient city of Bet She’an, one of the cities of the Decapolis with its well-preserved Roman amphitheater. The city is located at the foot of Mount Gilboa, where King Saul and his son died by their own hands in battle with the Philistines. On the way to Jerusalem, stop for a breathtaking panoramic view of the Holy City, considered one of the oldest places in the world, with a history dating back as far as 4000 BC. This morning, drive to Ein Karem and visit the CHURCH OF ST. JOHN THE BAPTIST and the CHURCH OF VISITATION, said to be built over the home of John the Baptist’s parents. Enjoy a beautiful view of the valley and surrounding wooded hills. Continue to Bethlehem and see Shepherd’s Field, where the angels announced the birth of Jesus. Next, visit the CHURCH OF THE NATIVITY on the site where Jesus was born. On the way back to Jerusalem, visit the GARDEN TOMB. After a stunning view of the city from the revered MOUNT OF OLIVES, start your guided walking tour. Via the Chapel of Dominus Flevit, designed in the shape of a teardrop to symbolize the tears of Christ, arrive at the GARDEN OF GETHSEMANE, where Jesus prayed the night before his arrest. Nearby are the Cave of the Assumption of Mary, believed to be the Virgin Mary’s tomb; and the Cave of Betrayal, where Judas betrayed Jesus. Follow the VIA DOLOROSA with its nine Stations of the Cross, marking the path Jesus walked on the way to his crucifixion. At Golgotha, visit the CHURCH OF THE HOLY SEPULCHRE, erected on the site of the crucifixion and which houses the remaining five Stations of the Cross. Walk past the Temple Mount to see the Dome of the Rock, which is sacred to both the Jewish and Muslim people. On to the WESTERN WALL, the only remnant of the Second Temple, then stroll through the restored Jewish Quarter to MOUNT ZION and visit the UPPER ROOM, where Jesus and his disciples had the Last Supper; the TOMB OF KING DAVID; and the HOUSE OF CAIAPHAS, where Jesus was kept the night after his arrest and where Peter denied knowing him three times. Spend a full day at leisure, with time to attend a worship service at one of Jerusalem’s churches. 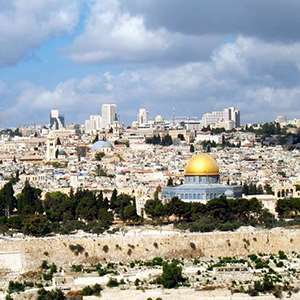 Later, maybe join an optional excursion that includes a visit to the Israel Museum to see the Shrine of the Book and the Dead Sea Scrolls; the Holocaust Memorial at Yad Vashem; and the Inn of the Good Samaritan. Today, travel through the Judean wilderness to the Dead Sea, the planet’s lowest point on dry land. Enjoy the scenery as you follow the road between the salty water and majestic desert mountains. Catch glimpses of the Caves of Qumran, where the precious Dead Sea Scrolls were found. Ascend by CABLE CAR to the spectacular clifftop FORTRESS OF MASADA, and hear how 960 Jewish rebels made their last stand against Roman forces. Around lunchtime, reach your comfortable DEAD SEA RESORT for free time to experience the incredible buoyancy in the heavy saltwater. Return to Jerusalem, and join your traveling companions one last time at tonight’s farewell dinner to celebrate the blessings you experienced on your Holy Land adventure. A comfortable drive across the Allenby Bridge brings you to Jordan. Drive north to Jerash, the best-preserved Greco-Roman city in the Middle East, before arriving in Jordan’s capital, Amman. An exciting visit to Wadi Rum is on the program today. Wadi Rum is the largest wadi (ravine) in Jordan and made eternally famous through the movie Lawrence of Arabia. Enjoy spectacular FOUR-WHEELING through the sand dunes and receive a keffiyeh, a local headscarf. 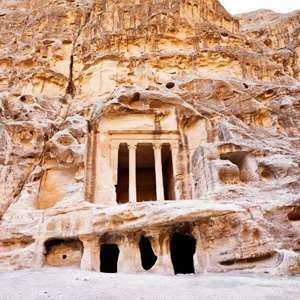 Continue to the “Rose-Red City” of Petra, where you can relax at your hotel this evening or explore the ancient city. The entire day is dedicated to guided sightseeing in Petra, a UNESCO World Heritage Site and one of the New 7 Wonders of the World®. Lost to the world for centuries, it is located in the biblical land of Moab. Enjoy an unforgettable experience as you walk down the SIQ, the narrow gorge made famous in Indiana Jones and the Last Crusade, and stand in awe in front of the iconic TREASURY. You’ll see spectacular temples and tombs created out of the rose-colored sandstone, and sip tea in a real BEDOUIN TENT. This morning features Kerak with a visit to the CRUSADER CASTLE and Wadi Mujib, the “Jordanian Grand Canyon.” Continue to your hotel at the Dead Sea for your 2-night stay. A fascinating day awaits! Stop in Madaba to visit ST. GEORGE’S CHURCH, which houses a precious 6th-century mosaic map of the Holy Land. Also, explore the MADABA ARCHAEOLOGICAL MUSEUM. Today’s major highlight is a visit to MOUNT NEBO, where Moses saw the Promised Land. Next is Bethany Beyond the Jordan, where Jesus was baptized by John the Baptist. Your vacation ends with breakfast this morning (the nearest airport is Amman). Enjoy the spectacular light show at the Tower of David followed by a delicious Middle Eastern dinner. Experience a full day guided tour of the Judean Desert. Enjoy a guided excursion to Little Petra or Al Beidha, once a commercial area and on the trade route to the north and northwest.